Enduring America reports that the funeral procession for Grand Ayatollah Husain Ali Montazeri began at 9:30 am in Iran. The initial regime announcement of the senior cleric’s death omitted his titles. Once in line to succeed Imam Ruhollah Khomeini as Iran’s supreme leader, he broke with the regime in 1988 over massacres of dissidents, and was thereafter marginalized by the Tehran elite. Al-Hayat transmits from a Persian site a report that senior pro-reform clergymen met in Montazeri’s home before the funeral procession. It adds that foreign journalists are not being allowed to cover the events. Ayandeh, an opposition site connected to Mohsen Rezai (a failed presidential candidate in the recent election and former head of the Iranian Revolutionary Guards Corps) says that despite reported regime determination to prevent the procession from turning into an anti-regime demonstration,tens of thousands of mourners lined the streets and gathered at a holy shrine in Qom. Opposition leaders Mir Hosain Mousavi and Ali Karroubi called for Monday to be a national day of mourning according to the opposition web site Rah-e Sabz, and said that they would be at the funeral. Montazeri was an outspoken critic of the flawed presidential elections held in June and of incumbent president Mahmoud Ahmadinejad. He dismissed the regime in its current form as mere dictators. Nobel Peace Prize winner Shirin Abadi issued a statement praising Montazeri as “the father of human rights” in Iran. She said he was like a father to her in demonstrating how it was possible to stand up for political prisoners and dissidents. Al-Hayat says that crowds of mourners at a mosque in Najafabad chanted in the name of liberty and pledged to follow Montazeri’s path. The mourning period for Montazeri comes at a particularly difficult time for the regime. The month of Muharram is marked by public mourning ceremonies for the martyrdom of the grandson of the Prophet Muhammad, Imam Husayn b. Ali. The regime cannot therefore just clear the streets, and cannot prevent the religious mourning from being mixed in with politics. Montazeri is more important as a symbol than a leader, and he may remain so in death. I’ve seen analysts suggesting that his passing is a blow to the reform movement, but that view seems to me unfounded. Even Mousavi and Karroubi do not seem much in control of the movement, which is a wide set of urban networks that more resembles a ‘flash mob’ than a disciplined party. In any case, commemorating a martyr, which is how his supporters see Montazeri, is a far more important political repertoire in Iran than taking inspiration from a living elder statesman. For Montazeri to die on the threshold of the Ashura mourning processions is a real problem for the authorities. Just as American rule in Iraq always became shakier in the Shiite south when people were stirred by the passion of Husayn during Muharram, so the theocratic regime in Tehran faces special difficulties in the face of massive, emotional crowds. The regime will breathe a sigh of relief, since Montazeri helped craft the docrrine of the guardianship of the Jurisprudent, which the current government interprets as clerical dictatorship. But Montazeri maintains that that outcome was never Khomeini’s intent. It is sort of as though there was a living disciple of Jesus around who insisted that he never intended the pope to be infallible. 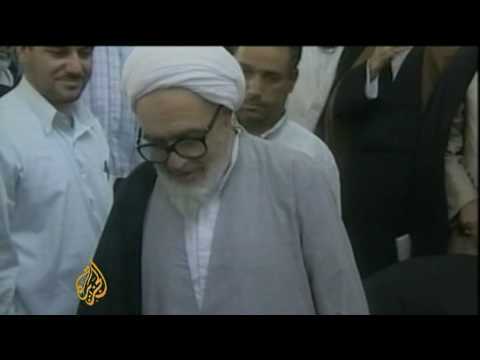 Montazeri was a powerful living witness to an alternative form of Shiite government, one with a human face. The hardliners such as Khamenei and Ahmadinejad will be delighted to have that voice silenced.